The day dawned grey and heavy, the track still glistening at the kerbs as the runners took to FP3. Mercedes at the top on much cooler temps and several tenths off yesterday even at the top. 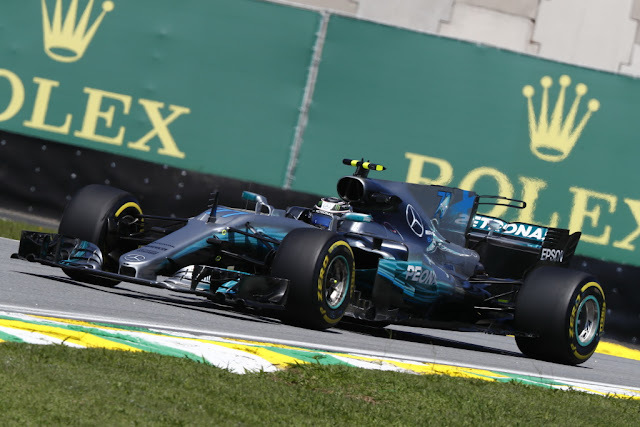 Bottas nabbed top honours going into the qualifying session, but historically the table looked set for Lewis, as his improvement between FP3 and Q3 is more than enough to give him pole yet again, despite the top 4 being separated by mere hundredths. Of course, there is a reason they run the session, and that is that anything can (and often does) happen, especially in Brasil. 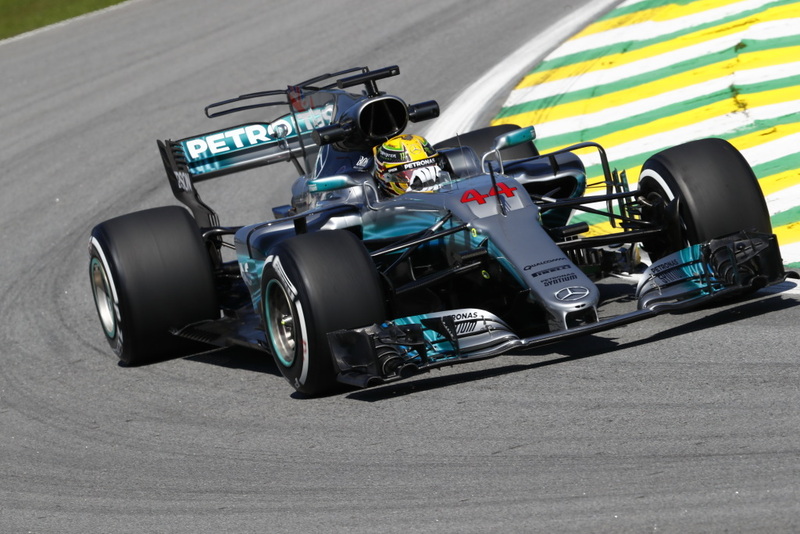 Such as a pack of Mercedes personnel robbed at gunpoint, for example which happened as they were leaving the track last night and generally unsettled the paddock. Not as much as the sudden, and rather vicious, war of words between Toro Rosso and Renault, with Viry blaming the team for their engines blowing up rather consistently and the team from Faenza pointing out that 1: all the failures have been on the PU and A: that Renault hangs a mere 5 points back in the WCC from TR and, well, it doesn't take a genius to connect those dots. The big news from the tech front is that McLaren, at the latest Strategy Group Meeting, has effectively scuppered the large shark fin, as they want a smaller one because the rear wing is hard to see from certain angles, and, oh yeah, BTW, the smaller one will probably work a lot better with our design. OF course, the rest of the teams, and the FIA have for months now been working with the concept of the larger one, as it had been unanimous amongst the teams when the subject first was raised, months ago. What happens next remains to be seen, as the time for 2018 development is disappearing rapidly. Along those same lines, Christian Horner and Red Bull, who were delighted with the concept of all but spec engines, pronounce themselves rather unhappy at the idea of mostly spec aero, so it's good to know some things NEVER change, particularly when it comes to F1 teams and self-interest. Sector 2 rules Brasil and the car that is fastest through the twisty bits will be best suited to carry that momentum up the hill and across the line, but the imminent threat of rain and drizzle hung over the circuit as the opening of the pitlane and start of the session approached threatened to undermine the existing order. Hamilton, Bottas, Wehrlein were first off, accompanied shortly by the Sauber of Ericsson as it was a race (hahaha!!) to get a lap in before conditions deteriorated. And just like that, massive slide for Hamilton as everyone was just settling into their pints and slippers. Into the wall laterally, crunching the front left side of the car, game over for Lewis. The rear of the car stepped out as Hamilton dropped it into 5th and there was no saving it from that point. Replays showed the car bottoming as well, but likely that's gonna be chalked up to driver error, extremely rare occurrence this season for Lewis. Red flag was the result and an interesting start from the back, the first of the surprises for tomorrow's race. Hulkenberg, Hartley, Wehrlein and Sainz led the way with Verstappen and Alonso bringing up the rear of the field as everyone was out for real to get a banker in. Complaint from Raikkonnen on the radio about traffic was the immediate, and hilarious result. Ocon from Sainz, from Hulkenberg early on, then Bottas came through, but only on a 1:10.053. Verstappen easily surpassed that, well OK, by the best part of a tenth but still. Ferrari were out on the Softs in an effort to save tyres. Apparently not a problem for them as on second effort, with the tyres fully up to temps, Raikkonen was able to surpass Bottas for P1. Verstappen was on the radio complaining of engine issues, and he lingered P4 to Ricciardo's P5, with Vettel P3 as the the clock dipped under the 7 minute mark. Wehrlein, Ericsson, Stroll, and Hartley had it all to do, as Bottas continued to stay out and run laps, along with Vettel. 5 minutes to go and finally the Finn came in, as the back of the field were off for their last shot at the glory of Q2. Horner assured everyone the PU was fine, it was down to the fact he was on slow lap and the settings just made it feel that way. 3 minutes to go and Grosjean went P8, missing half of the T wing. Hartley to P15 put Wehrlein into the drop zone. Gasly could do no better than P17 while Hulkenberg rocked it up to P6, taking best of the rest away from Perez. With time almost gone, Felipe Massa was on a personal best, and he followed through, cheered on by the hometown crowd to P4. This performance wasn't exactly matched by Stroll, who trailed behind and finished a rather meagre P18, a full second off the pace of his teammate. 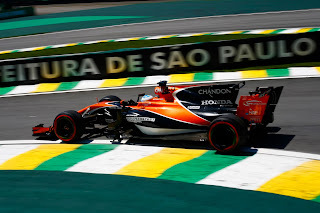 Wehrlein, Gasly, Stroll, Ericsson and Hamilton done like a dinner and off for some Pão de Queijo as the rest turned it round for the next session. Bottas led the way for Q2, Ocon and Perez for company,as pit radio announced drops in the pitlane. 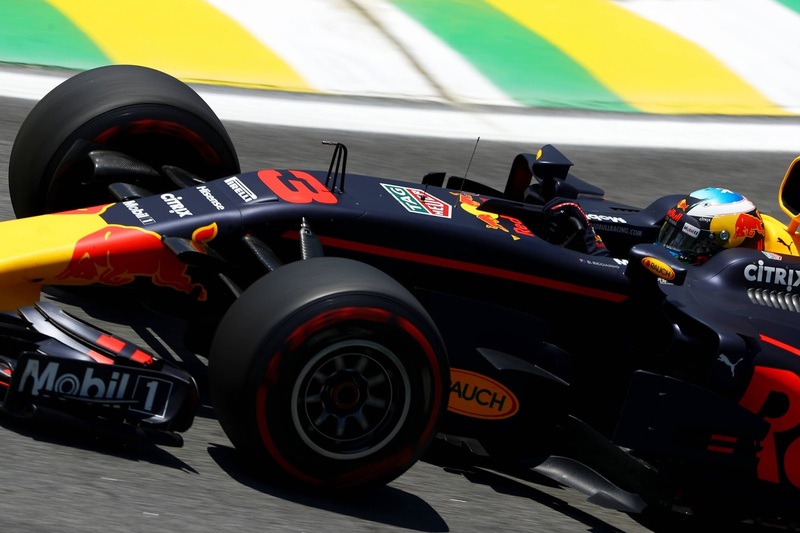 Only Ricciardo dared to be different, running the Softs in honour of his upcoming grid penalty. Boom!!! Bottas to the 1:08's and P1, followed by Vettel and Raikkonen. The Red Bulls trailed behind, Verstappen leading Ricciardo, and it was, for the moment, Alonso best of the rest. New lap record for Bottas as Massa knifed across the line to split the Red Bulls, P5 and looking wicked indeed. Grosjean, Vandoorne, Hulkenber, Magnussen and Hartley had it all to do with 7 minutes left in the session as they retired to the pits to reset and have their final toss at the palmares of Q3. Bit of a confusion on the way in, as the red light was less than accurate in telling Verstappen and not Alonso, that he was due at the FIA weighbridge. Ocon and Hartley were first off, less than 4 minutes left to go. AS they came around for lap 2, Hartley ran into the pits and Perez was released ahead of Ocon, a quarter lap between them. Ocon to P7, but only a tenth up on the elimination time. Even the big boys were out, only Massa saving tyres stayed put. Perez went clear of Ocon and then it was Hulkenberg's turn to take P7, tditching Sainz. Grosjean to P9 eliminated Alonso. Fernando off to P6 then wiped out Ocon, who was on it and running personal bests. P11 for Ocon so no glory for him, as he and Grosjeean were done, Sainz claiming the last spot in the top 10. 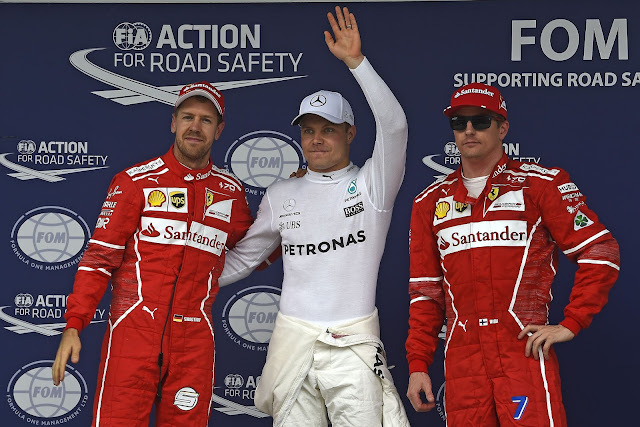 At the front, Bottas improved his time by several tenths, but it was not enough as Vettel crushed it, up to 1:08.494 and Ferrari's clearest path to redemption lay before him in Q3. 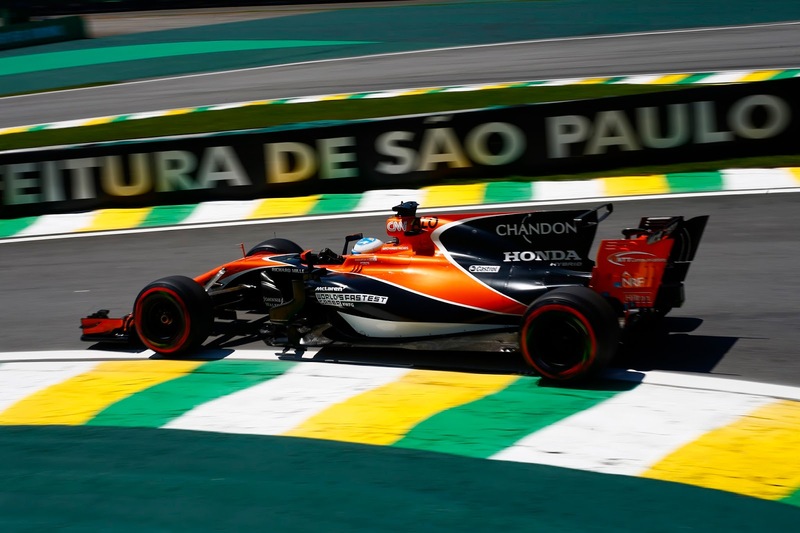 Going no further were Ocon, Grosjean, Vandoorne, Magnussen and Hartley, off in search of caipirinhas and solace. Bottas was first off in search of glory rocking onto the lonely circuit with the full weight of Mercedes' hopes riding on his shoulders. AS he hustled up the hill and ont the start finish the trio of Hulkenberg, Vettel and Verstappen ventured forth to do battle. AS he Bottas came to the line it was a 1:08.442, fastest time thus far. Vettel was rocking up the purple sectors as Valterri hit the line and he maintained through the critical S2 which handed him P1, with a 1:08.36, even though he couldn't make it a trifecta with S3, Mercedes deployment winning the battle with Ferrari. Raikkonen went P3 and then it was the Red Bulls and Perez. Massa sat out the traffic for a his first run and attempting to avoid the literal only other car on track almost lost it in the exact same way that Lewis did. This was accompanied by Sainz complaining that Massa had held him up during his hot lap, so perhaps status quo ante for the final runs. 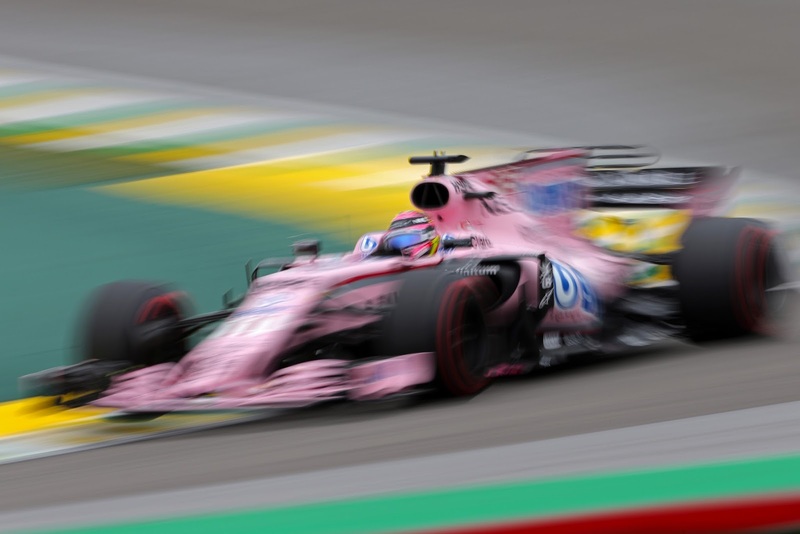 Perez was first off the blocks, but it was to the sound of raindrops, as calls about the weather peppered team radio. 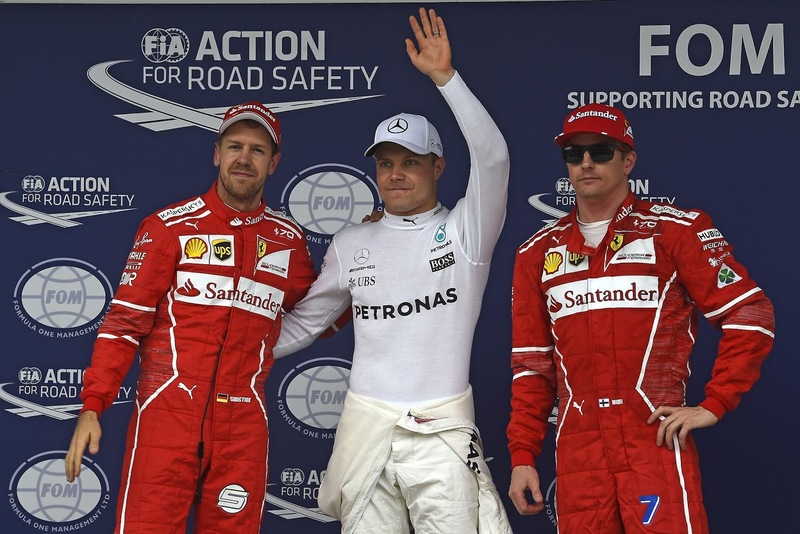 It was Raikkonen that was on fire, though, quicker in S1 only to be outdone by Bottas, who was in the catbird seat, last across the line. Verstappen P4, Raikkonen P3 just behind Vettel and then it was Bottas!!! taking all but the middle sector for P1 by the skinny margin of 0.038 seconds. Perez maintained his dominance of the rest of the midfield, but it will be Alonso starting P6 (thanks to Ricciardo's grid penalty) just behind him that will be making for happy days at McLaren. The gap in the midfield is particularly perilous, with P6-P12 (as they finished qualifying) covered by just 0.5 seconds and promising oodles of action for the race tomorrow. Also fun will be tracking the progress of both Ricciardo and Hamilton as with the championship done it will be Maximum Attack from the Mercedes and Red Bull. Maximum disappointment for Massa however, as P10 was the best he could do, slower than his fastest time in Q2 by several tenths. He was off to complain to Charlie, saying Carlos held him up on purpose, as payback for Massa holding Sainz up earlier. Sainz, clearly had a different account of his words and denied any purposeful interference. *HeadDesk*. Frankly, I'd blame Williams' timing well ahead of the drivers, but hey, keeps the clicks coming I suppose. 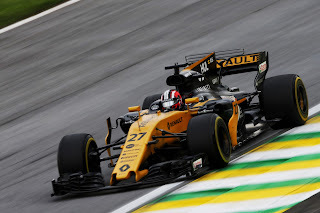 Finally, barely more than a hundredth separated Hulkenberg and Sainz at the end of the session, finally the meeting of the teammates that we've been awaiting at Renault, and that battle within a battle will be one to keep an eye on.